By Allison Graves, Neelesh Moorthy on Wednesday, July 27th, 2016 at 8:57 p.m.
President Barack Obama squarely denounced Donald Trump’s portrayal of the United States as lawless and weak, saying he is ready to pass the baton off to Democratic nominee Hillary Clinton to build on the country’s progress. 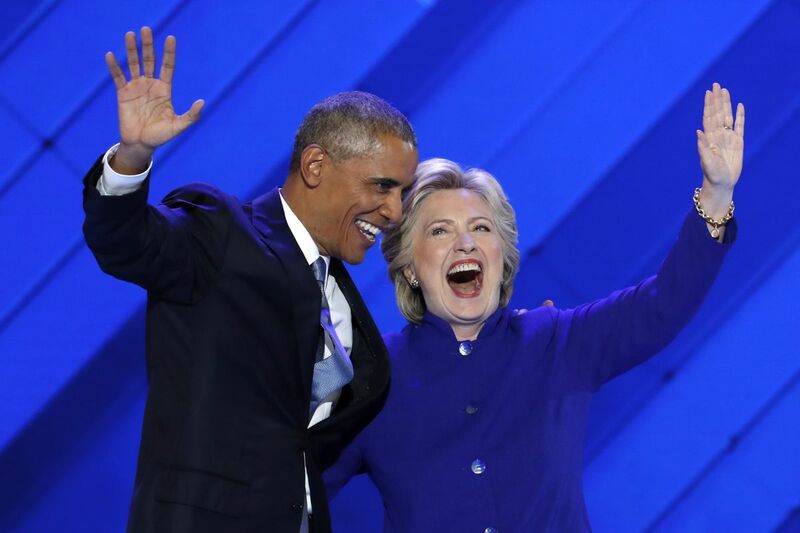 "This year, in this election, I’m asking you to join me — to reject cynicism and reject fear and to summon what’s best in us; to elect Hillary Clinton as the next president of the United States, and show the world we still believe in the promise of this great nation," Obama said in his speech headlining the convention’s third night. Wednesday saw more of the party’s bigwigs, with speeches from Vice President Joe Biden and Clinton’s running mate Tim Kaine. Kaine commented on his time in the Senate, saying that behind closed doors Republicans acknowledged "how fantastic a senator Hillary Clinton was." Trump also may be softening his position, without offering specifics and no mention of mass deportation on his campaign website. On balance, we rated Bass’ statement Half True. Bill Clinton used his speech to promote his wife’s record of public service including her record on climate change. Along these lines, Bill Clinton cited the Copenhagen Accord of 2009. "She put climate change at the center of our foreign policy. She negotiated the first agreement ever — ever — where China and India officially committed to reduce their emissions," Bill Clinton said. As Secretary of State, Hillary Clinton was certainly involved in negotiating the deal, which did include emission reductions for China and India, which had previously called for cuts to be concentrated in developed nations. But the agreement was loose, by design—instead of signing the accord, the participating countries officially "took note" of it. The voluntary aspect of the Copenhagen Accord has been the subject of criticism by environmentalists. Because Bill Clinton’s account doesn’t provide this useful context, we rated it Half True. In a video introducing Bill Clinton’s convention speech, he advanced a bold claim about the accomplishments of his administration that we’ve encountered before. "We moved 100 times as many people out of poverty as moved out when President (Ronald) Reagan was in office, with 40 percent more jobs," Clinton said. We’d checked the claim about poverty when Hillary made it in July and October of 2014, and it's about five times to high, if you use a consistent time frame. The right number is still impressive, but the Clintons keep referring to the inflated figure instead. The 40 percent number, on the other hand, is basically right, though favorable economic conditions at the outset of the Clinton administration may have played a role. Part of this statement is wrong; part of it is accurate. We called it Half True. Did Trump leave investors in Florida condos hanging? Kaine suggested that he did, taking payments for himself while the buildings were left unbuilt and investor deposits disappeared. The two projects Kaine was referring to were named after Trump, and may have been sold based on his reputation, but Trump was not involved in the projects beyond that point. The developers paid Trump for the use of his name. The projects never went forward, and many investors lost money—so Trump did take money away from the project while investors were stiffed. Kaine, however, left out relevant context about Trump’s level of involvement, so we rated his statement Half True.